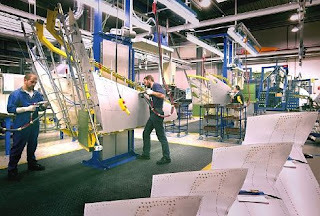 With around 1,800 employees, FACC is one of the world’s leading companies in the design, development and production of advanced fiber reinforced composite components and systems for the aviation industry. Their range of products reaches from structural components (spoilers and winglets in A350 XWB program) to engine components (in this case weight-optimised translating sleeves and engine components) to complete passenger cabins for passenger planes and helicopters (in A350 XWB, passenger door lining, smoke detection covers and overhead stowage compartments). FACC also participates in other programs from Airbus (A380, A340, A320), Boeing (787), Bombardier, Embraer, Sukhoi, and COMAC as well as for engine manufacturers as Rolls Royce. With a manufacturing facility planned to be open in China, FACC has been a partner with Mubadala supporting them in the new Strata facility. With the maximum rate in the program, around 250 employees at the three production sites in Austria will be working on the production of the A350 XWB components. FACC is responsible for the development, qualification including testing, the design and manufacture of the production tools as well as production and assembly of the individual components to create a system ready-to-install. FACC team working in the program, with more than 100 experts, have been located in Austria, Bratislava and also on site at Airbus in Filton/UK. With this project, FACC is also achieving new dimensions in component testing: so for the first time on parts of this size – the largest component measures six metres - full scale tests are being carried out at FACC. This involves subjecting the complete winglet system to static and dynamic testing for resilience, fatigue and endurance, up to mechanical failure. 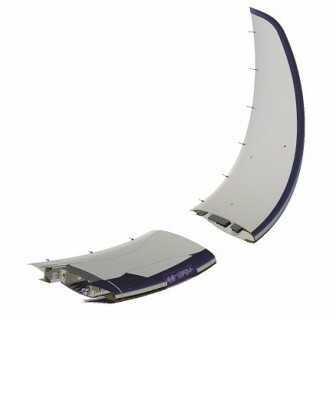 The winglet unit consists of the wingtip (wing extension) and the attached winglet as can be watched in the croquis above. Airbus adopting a “minimum-change approach”. A350 XWB virtually makes it´s First Flight.